What Is VA Form 21-0779? VA Form 21-0779, Request for Nursing Home Information in Connection with Claim for Aid and Attendance is a form used to put the level of care required by a claimant or a claimant's dependent on record. This form is used only for certain non-service-connected pension claims. 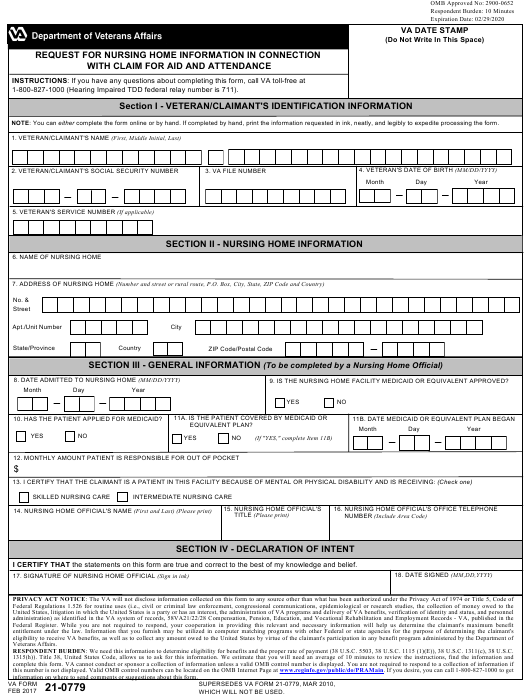 The latest version of the form was released by the Department of Veterans Affairs (VA) in February 2017 with all previous editions obsolete. An up-to-date VA Form 21-0779 fillable version is available for digital filing and download below or can be found through the VA Forms website. The VA "Aid and Attendance Form 21-0779" is designed specifically for individuals who are residents of nursing homes. Documenting the level of required care is necessary to support a claim for additional pension above and beyond the base level and to support the need for certain medical expenses. Accessing medical records is vital in advocating for quality care for residents. Residents and their legal representatives have the right to put in a request for nursing home records pertaining to their care, including current clinical records. Residents also have the right to purchase additional photocopies of their medical records. A claim cannot be filed with a general or durable power of attorney. How To Fill Out Va Form 21-0779? Where To Mail Va Form 21-0779? 1-800-827-1000 (Hearing Impaired TDD federal relay number is 711). NOTE: You can either complete the form online or by hand. If completed by hand, print the information requested in ink, neatly, and legibly to expedite processing the form. 9. IS THE NURSING HOME FACILITY MEDICAID OR EQUIVALENT APPROVED? 10. HAS THE PATIENT APPLIED FOR MEDICAID? RESPONDENT BURDEN: We need this information to determine eligibility for benefits and the proper rate of payment (38 U.S.C. 5503, 38 U.S.C. 1115 (1)(E)), 38 U.S.C. 1311(c), 38 U.S.C. information on where to send comments or suggestions about this form. The VA form 21-0779 is distributed without the filling guidelines provided. Section I. Veteran/Claimant's Identification information. If you are a veteran or a claimant, enter your full name, social security number, VA file number, date of birth, and service number, if applicable. Section II. Nursing Home Information. Provide the name and address of the nursing home, including the unit number and street or rural route, P.O. box, city, state, zip code, and country. Section III. General Information. It is completed by a nursing home official. State the date of the patient's admission to the nursing home, the date Medicaid or equivalent plan began, monthly amount patient is responsible for out of pocket. Provide your full name, title, and telephone number. Answer several questions by providing data, whether the nursing home facility is Medicaid or equivalent has been approved, whether the patient has applied for Medicaid or an equivalent plan. You have to certify that the patient is in the facility because of mental or physical disability and is receiving skilled nursing care or intermediate nursing care. Section IV. Declaration of Intent. Lastly, certify that the statements on this form are true and correct to the best of your knowledge and belief, sign and date the form. VA Form 21P-8416, Medical Expense Report. Voided Check for Aid and Attendance Direct Deposit. The claimant filing this form should remember that this form can be used for both supporting a claim for a higher level of pension and the need for certain medical expenses. Those two purposes should be kept in mind when a claimant opts for a VA claim, and when reviewing its completion by the nursing home to make sure there are no unexpected results with the claim. The completed VA Form 21-0779 is filed as part of a fully developed claim. The form, completed either manually or online, should be presented in person or mailed to the local VA regional office. A duly appointed service organization, an employee of the local regional VA office, or a VA approved accredited agent or attorney can help a veteran or surviving spouse file a claim. The claimant may contact a Veterans Service Officer from a local Veterans Service Organization. The Fully Developed Claim (FDC) program is the fastest way to get the claim processed. It requires submitting all evidence or supporting papers when filing the claim. When filing the standard claim, the claimant only gives the VA permission to gather evidence. The claimant should complete and submit the VA Form 21P-527EZ, Application for Pension and all supporting documents to the VA. The VA Form 21-0779 is necessary when the claimant is in the nursing home. Participating in the FDC program is optional and does not affect the claimant's benefits. If the claim is filed under the FDC and the VA requires additional information, it will remove the claim from the program and process it in a standard way.